Martin Lishman Minitemp Hand-Held MonitorPreviously requiring cables running over the grain surface to connect to probes in the grain, or the labour-intensive process of walking the grain heap and pushing in a probe to take readings, Minitemp Blue uses Bluetooth technology to make the job simpler and a lot less time consuming. 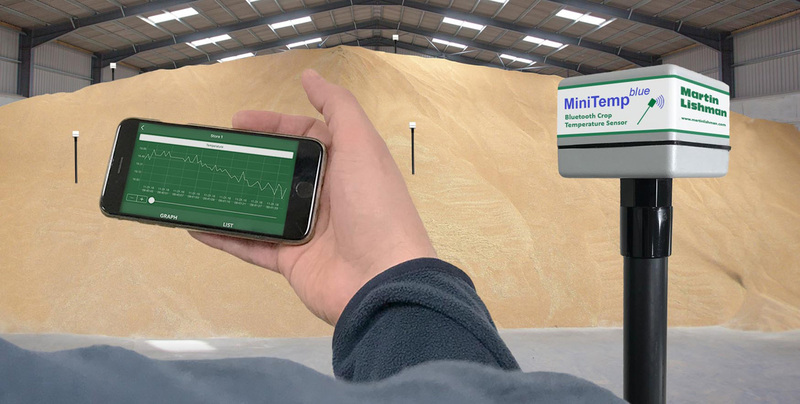 When they enter the store, users of Minitemp Blue will be able to open an App on their smartphone and view crop readings instantly. Mounted on 2 metre or 3 metre static temperature probes inserted into the grain, the Bluetooth unit will transmit readings over 20-30 metres depending on the configuration of the grain surface. It may be necessary to gain line of sight to more distant sensors, but the days of walking extensively over the grain surface will be avoided. Having instant readings will enable store managers to make quick decisions on when and where to use crop ventilation fans. Used in conjunction with a Martin Lishman automatic fan controller, this can contribute to greater storage efficiency and significant energy cost savings. As well as taking instant measurements, Minitemp Blue will also make it possible to store and download to a PC up to 6 months’ worth of temperature readings at a time. This will certainly help those who are required to submit regular data records to conform to quality assurance schemes.